Lifeboat, the Oscar-nominated documentary short, is a sobering examination of mass immigration. It tells the harrowing story of refugees who attempt to cross the Mediterranean Sea from the northern coast of Africa. 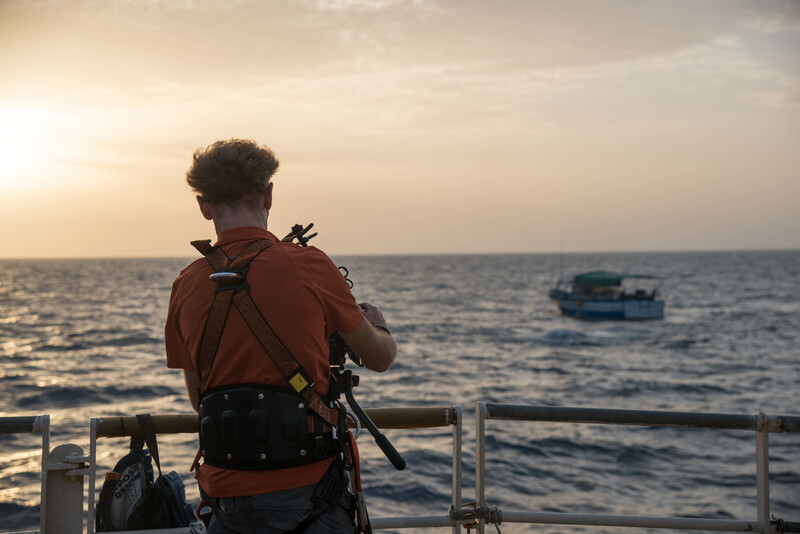 Director Skye Fitzgerald and Producer Bryn Mooser follow a rescue team from the German non-profit Sea-Watch, which helps carry refugee boats off the coast of Libya to safety. ProductionHUB member Skye Fitzgerald gives us a behind-the-scenes look. 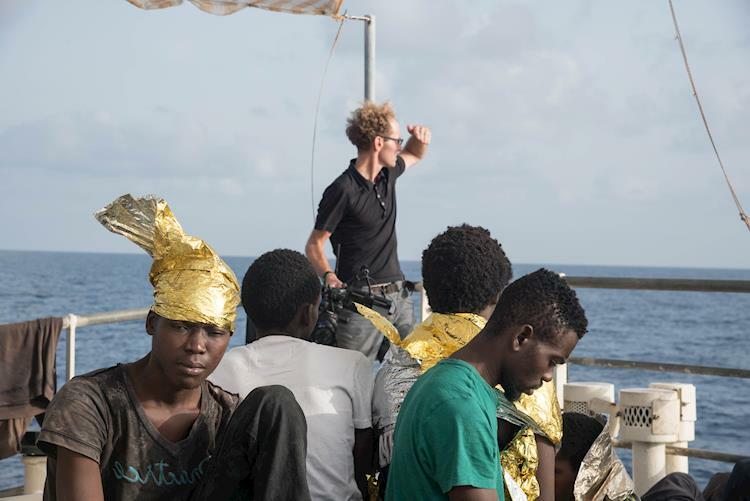 The documentary's beautiful cinematography is enhanced by the staggering sight of hundreds of refugees packed onto flimsy inflatable lifeboats, and we hear firsthand accounts of human trafficking and abuse as we watch the members of Sea-Watch distribute life jackets and try to get the people onto more secure transportation. PH: What equipment did you trust to get the job done and why? Skye Fitzgerald: By necessity, we were a crew of two on the water due to the size of the ship and limited space. From an equipment standpoint, we were an equipment hodge-podge simply because we had no budget. That said because my DP and I both earn our livings as DoP’s we simply brought our existing doc equipment to the project. My DP brought his own FS7, I brought my own, older c100 that we fed into a Shogun and we matched Canon’s C-log to Sony’s S-log as closely as possible before-hand. We also leveraged a Canon DSLR and Go Pro’s for handheld, dangerous work on Zodiacs when there was a very real chance that we could lose a camera to the ocean or the perils of salt water. PH: In your opinion, what makes a documentary Oscar worthy? Skye Fitzgerald: Most important for me, a film must have heart and pass the ‘so what’ test. Does the film tackle an enduring issue we face as human beings on this planet with nuance and curiosity and force us to see it in a new way? Beyond access to the story, I believe there also ought to be a certain threshold of craftsmanship demonstrating the filmmaker’s dedication to the tools and language of cinema as opposed to other mediums. PH: Tell me about Lifeboat. How did the project come together? Skye Fitzgerald: I was inspired by the fact that Sea-Watch, a small German NGO was intervening in the refugee crisis in the absence of meaningful action on the part of the EU authorities. The fact that civil society intervention was saving lives when our leaders and nation-states were not was deeply inspiring and for me, a testament to the power of individual action. My intent is always to create the strongest and most compelling film I can within the limited scope of my filmmaking resources. From the beginning, I believed the film could be a strong, statement eliciting empathy for asylum seekers desperate to escape torture, servitude and deadening poverty. PH: What was the pre-production process like? What story did you aim to tell? Skye Fitzgerald: LIFEBOAT is the second in a trilogy of short films exploring the global refugee crisis. 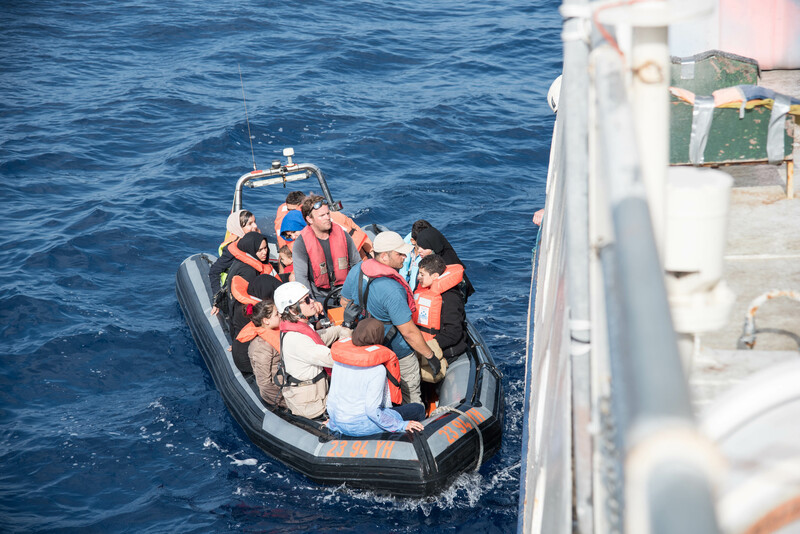 One of the most difficult parts of putting the project together was gaining the trust of the Search and Rescue operators in the Mediterranean and convincing them that we would do the story of their hard work justice. PH: What challenges did you run into? Skye Fitzgerald: Filming aboard a search-and-rescue operation is inherently tragic and harrowing. We found ourselves in a constant dance between acting on humanitarian impulses (saving lives) and filming the unfolding tragedy before us. PH: What was your favorite scene in the film? What impact do you want the film to have on the audience? Skye Fitzgerald: My favorite scene in LIFEBOAT is a single uninterrupted shot well over a minute long. At night, we see a light flickering out over the water which, through a rack focus, transforms into multiple lights with color. And while we watch these lights grow and transform we hear the central character of the film provide subtext via VO as the image racks into focus. In terms of impact, the intent was to build empathy. One of my beliefs is that if we can generate empathy for others it becomes exceedingly difficult to create barriers. We live in an age when divisive rhetoric often destroys opportunities for meaningful dialogue. I believe the more we can make each other FEEL for those less fortunate than ourselves the more likely we are to solve the major issues of our time. Lastly, I believe that 50 years from now history will not reflect well on the global community’s response to the current refugee crisis. We are currently facing the greatest displacement of human beings on this planet since WW II. To not act on the humanitarian principles enshrined in the Universal Declaration of Human rights reflects a dearth of moral principle that we ought to be ashamed of. I can not, not act.